The adventures of these individuals nice or not will captive you until the end. Ocean, war for the United States or for England, prisoners before marriage, captured by savages, mystic character, families’ arguments, etc. are some themes that you will like. A nice journey for you! Three days later Fred sat in the parlor of an unpretending looking hotel, carelessly glancing over a newspaper, when a waiter entered, and announced "that a gemman was 'quirin' for him down stairs." "For me?" repeated Fred. "Who can it be?" "Dunno, sah," replied the darkey, fancying the question was addressed to himself; "I ‘spect…"
"Show him up," said Fred, cutting short the darkey's explanation. "Mr. Stanley, I believe," he said, courteously. "Yes, sir," replied Fred, bowing; "but I regret to say I am quite ignorant of the name of…"
"Ah! beg pardon!" interrupted the new-comer. "My name is Nugent Percival. I wish I could thank you sufficiently for the inestimable service you have rendered us all, in saving my sister's life." Fred strove to effect a genteel indifference, though he felt the blood rushing to his face. "Pray do not mention it," he replied. "I am only too happy to have had the opportunity of saving her. I trust she is well?" "Yes; Edith is quite well, and joins most urgently with the rest of the family in inviting you to return with me home. Do not refuse, Mr. Stanley," he continued, seeing the almost haughty expression of Fred's face. "You have no idea how disappointed they will all be. Gus would have accompanied me here. But my sister Nell positively refused to let him go — for fear, as she expressed it, he might get shipwrecked again.'" Fred smiled, and walked, irresolutely, to the window. Edith urged him to return. His heart leaped at the words, but a moment's thought convinced him that Percival had merely used the words as a matter of form. Still, he felt an inward wish to go. Something made him fancy Edith was not wholly indifferent to him, and he longed to hear her say so with her own lips. But, then, her affianced, De Lisle? What if he were there? Well, even so it would be a comfort to see what manner of man his rival was. Still, there was an undefined hope that he was not at Percival Hall. "I hardly know," he said, hesitating, "whether to intrude a second time or not. There may be strangers…" He paused. "Only the family," said Percival, in his frank way. "So, if meeting strangers is your only objection, you see you can no longer refuse. Come, Stanley (excuse my familiarity), you must come back with me. I have been threatened with all manner of calamities by Nell (who, by the way, pronounces you 'a love of a man'), if I did not bring you." There was something Fred could not resist in the courteous, winning manner of young Percival. He resembled Edith, too, far more than did her sister. And this, perhaps, was the secret cause that drew Fred toward him. "Well, since a lady commands it, I must obey," he said, gayly, as he ran his fingers through his dark elf locks. "When do you start?" "My orders are to wait for you, sir," replied Percival; "and I shall most assuredly do so, not having courage to brave the storm I should meet with, did I venture to return without you. Therefore, until you are ready, I remain your very humble servant." "Then you are not likely to be detained," said Fred, "as I am like the soldier's wife — ready to march on a moment's warning." "Very good!" said Percival; "what say you to starting tomorrow?" "I have no objection," replied Fred. "I am only spending a day or two here, to kill time." The matter being thus arranged, Percival, after conversing for a short time on ordinary topics, took his leave. The next morning found them en route. There was, we must confess it, an unusual throbbing at Fred's heart, when he again encountered Edith. She was looking better, — more cheerful than he had ever seen her, he fancied — and the cold reserve with which she had formerly treated him, seemed entirely forgotten in the unfeigned pleasure with which she welcomed him back. Fred fancied, or rather hoped, this might be caused by the prolonged absence of De Lisle (who had not yet made his appearance), and noticing the eager happy look with which she met him, his heart leaped with the wild hope that perhaps she loved him after all. The greeting of the rest of the family was most cordial, especially that of Nell. That young lady declared "she hadn't a bit of fun since he left. That she never was at a loss for something to laugh at when he was present. It was so funny to see him sitting so stiff and dignified, looking more like a banished prince than an everyday Christian." A week passed rapidly away at Percival Hall. Rides, drives, and walks followed each other, in all of which Fred unaccountably found himself the companion of Edith. Gus, who was generally at his wit's end by the caprices of Nell, found enough to do in taking care of that eccentric young damsel. And Percival usually started off by himself, leaving the well-satisfied couples behind him to their own devices. There was a dangerous fascination for Fred in these interviews. Sometimes, feeling half-ashamed of loitering here in idleness, when duty called him elsewhere, he would resolve to depart immediately. But days passed on, and he found it impossible to tear himself away. He strove to stifle the twinges of conscience by specious arguments. But reflection would not be stifled, do as he would. "Well, Stanley, have my sisters introduced you to all the celebrities of the place?" asked Percival, one warm, sunny afternoon, as the whole party, after a longer ramble than usual, strolled toward the house. "No," said Nell; "we haven't visited the hermit yet!" "And why have you not brought him there Puss?" inquired her brother. "Because the Hermit was absent, off on one of his crazy rambles," replied Nell. "He only returned this morning. Old Mat, the gardener, told me." "Then suppose we go in a party, and pay the old man a visit?" said Percival. "Pray," inquired Fred, "who is the Hermit?" "Oh! a most singular and eccentric old man," replied Percival; "one alike feared and shunned and beloved by the villagers. He resides a few miles from here, near the seashore, and is a lunatic, but perfectly harmless. There is a range of rocks in that direction, which has been known from time immemorial by the name of 'The Cliffs,' and from his fondness for strolling about there, he has received the singular and somewhat romantic name of the Hermit of the Cliffs. He first made his appearance here a few years ago, and from his skill in herbs and medicine, became a favorite. He has built a sort of cabin up among the cliffs, and here he has since resided, spending his time in cultivating a little garden, or wandering among the rocks. His name is unknown, but he is, no doubt, some unfortunate, whom the cares of the world have made an idiot." "I feel rather curious to see this singular personage," said Fred. "Let us visit him by all means." "Is it not too far, brother?" said Edith, anxiously. "The sun will have set before we return." "Let us start, then," said Gus, "if we are to visit the wizard. There is no time to lose." For awhile the party walked on together, chatting gayly. But the usual phenomenon took place before they had proceeded far. Gus and Nell saw something very interesting on ahead that caused them to quicken their steps, while Fred and Edith found it quite convenient to walk slowly. There was a scarcely-repressed smile hovering about young Percival's lips, as, under the plea of acting as guide, he walked on by himself in advance of the rest. Two hours slow walking brought them to the cliffs, a high, steep, craggy range of rocks. As a matter of course, each party sought the cottage of the hermit by a different path. Fred and his fair companion, absorbed in conversation, had nearly forgotten the object of their visit, when, turning an abrupt angle in the path, he raised his head and shook back his dark locks, his eye fell on the most singular-looking personage he had ever beheld. It was an old man of grave and majestic aspect, who stood leaning on a staff. His long white hair and beard flowed over his robes, and gave to his pale, but benign countenance, a venerable look, that immediately commanded respect. A small skull-cap of black velvet was on his head, forming a strong contrast to the hoary whiteness of his aged locks. His dress was most singular, consisting of a long, flowing robe of some dark stuff, that swept the ground as he walked, and was confined at the waist by a girdle of black velvet. "Peace be between us, my children." "Amen, father!" responded Edith, who was familiar with the singular appearance and address of the hermit, while Fred still stood lost in wonder. "Why hast thou visited me this evening, my daughter?" said the old man, turning to Edith. "My friend " — and she glanced toward Fred..."has heard so much of the Hermit of the Cliffs, that he was anxious to visit you. Therefore I took the liberty of bringing him." The old man turned slowly, and fixed his mild, dark eye on the face of the young man. "What is thy name, my son?" he inquired. "I am called Frederic Stanley, good father," said Fred, raising his hat, and bowing with deep reverence. The eyes of the hermit were fixed on him long and steadily, as if striving to read his inmost thoughts. As if still uncertain, he approached. And pushing back the thick curls that fell darkly over the young man's brow, gazed earnestly into the calm, dark eyes that fearlessly met his own. Edith looked up in Fred's face with a smile. "Yes," said the hermit, at last, speaking more to himself than to the listeners, "he has his father's proud bearing and haughty eyes. The same impetuous bravery, but a nobler and more generous heart." "Do you know my father?" inquired the young man, in surprise. « Yes, better, perhaps, than he does himself. I know him for a rash, self-willed, obstinate, hard-hearted man." "Sir, he is my father!" said Fred, flushing angrily. The penetrating eye of the hermit was fixed steadily on his face. "And can you defend him," he said, "after parting from him as you did last?" Fred stood aghast. The meeting between the father and son had been strictly private. And yet this mysterious being seemed to know all that had occurred. "How came you to know of our last meeting?" he demanded imperiously. "Perhaps I know more than you are aware of, my son," said the hermit, while something like a faint smile passed over his face. "Pshaw!" exclaimed Fred, impetuously, "you have merely made a clever guess. Since you know we are both fiery tempered, it required no great skill to predict that we might differ." "Shall I convince you, most noble doubter, that I know of what I speak?" said the hermit, quietly. "If you can," replied Fred, with an incredulous smile. "Tell me of the past," said Fred, glancing meaningly at Edith. "Be it so. We will begin with your age. You will be twenty-five years old the third of next November." Fred bowed, with a look of surprise. "Your mother died alone and in sorrow. The hands of strangers placed her in the grave." Fred grew deadly pale, and drew back. "You have performed some great service for the lady by your side," continued the hermit, quietly. "And at present linger with her here, neglecting the duty for which your father has disowned you." "Enough sir," interrupted Fred, haughtily. "Be you man or demon, I will listen to no imputations on my conduct. How you have obtained this information concerning me, I know not; neither do I care. Come, Miss Percival, let us go. The evening air is too damp for you, and I see our friends are on their way home. I wish you good evening, Sir Sage." And raising his hat, Fred turned coldly away. "Stay one moment," said the hermit, laying his hand on the young man's arm, and speaking with such deep solemnity that it awed him in spite of himself. "Stay, rash youth, and be warned. Beware of false friends. There is danger at hand. You will soon meet one who can work you much evil. I am your friend, though you may not believe it. Go, and be warned! Despise not the words of one to whom age has brought wisdom. Farewell, my children, and Heaven bless you!" He bowed and turning slowly round, disappeared among the rocks. "Let us go," said Edith, who clung, pale and trembling, to Fred's arm; "his words frighten me." "Fear not, fairest Edith. Those ominous words were not meant for you," said Fred, gently, as he wrapped her shawl close around her, and hurried down the rocks. "It may be wrong — it may be superstitious," said Edith, "but I feel the strangest presentiment of coming danger stealing over me. Something terrible and undefined, from which I shrink in fear and horror." "I thought your nerves were too strong to be thus shaken by the idle raving of a moonstruck old man," said Fred, gravely. "I am not nervous," said Edith, earnestly. "It is a feeling for which I cannot account. Strange, is it not, that the old man could tell you of the past so truly?" "It is, indeed!" said Fred, thoughtfully. "I cannot account for it." During the remainder of the journey home, both were silent and thoughtful. It might be fancy, but Fred thought there was something more confiding than usual in the way Edith clung to his arm. The moonlight fell softly around, ere they reached Percival Hall, subduing with its lights and shadows the irregular outline of the building. As they walked slowly up the avenue in front, Nell came flying down the steps all in a flutter of surprise. "Edith! Edith!" she cried, as she caught sight of her sister, "guess who's come?" "Why, nobody less than Ralph De Lisle!" 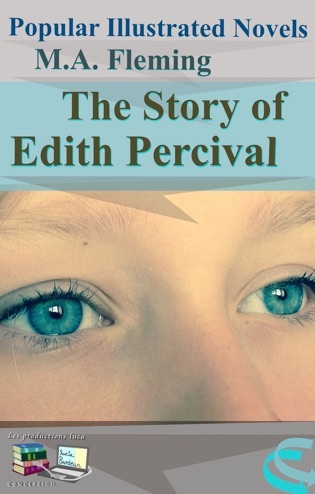 What meant Edith's convulsive start? She lifted her eyes to the dark, handsome face above her and Fred was struck by her deadly paleness. Their eyes met and that one glance told what their lips had never spoken.